Dr. Andrew Herrity, professor of business and entrepreneurship at California Baptist University, received the 2015- 2016 Trustees Scholar Award for his progressive research and concerns on the career endeavors of pre- and post-graduation business students and alumni. 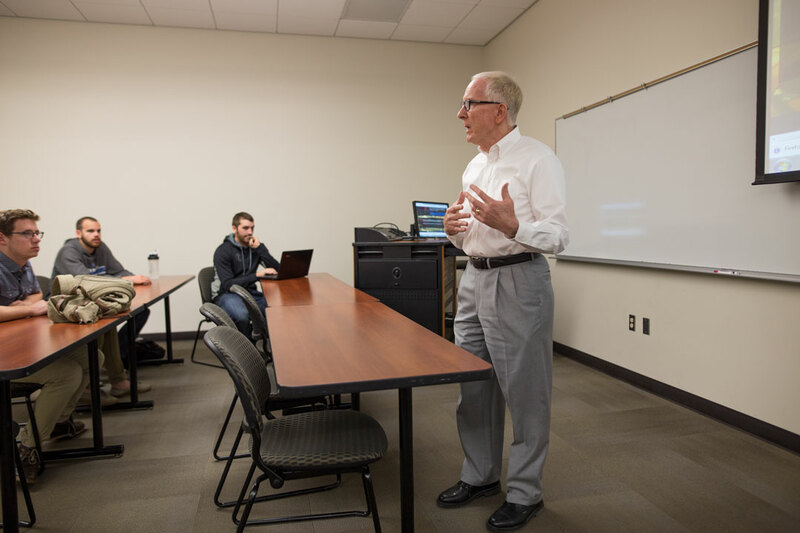 Dr. Steve Strombeck, professor of marketing and interim dean of the Dr. Robert K. Jabs School of Business, said the Trustees Scholar Award means Herrity is one of CBU’s top emerging scholars. “It was a great testimony to all his hard work and commitment to learning,” Strombeck said. Strombeck said Herrity’s current research project is about better understanding his students and where they are, what they are going through, and how he can help them become better people. Herrity said this was an accidental research project, so little by little he began treating this as a research project. He begins every encounter with alumni with one main question, which is asking what the biggest struggle is at work. He gives open-ended questions, making the conversation often up to an hour long before he and the student identify what is the most substantial problem. Another area of struggle Herrity has uncovered is with bosses. He said in today’s world, many bosses do not make time to ask what is and is not working in the workplace. “If it’s the boss, I have a set of questions I give them to ask the boss, including things like what exactly the expectations are and then to begin to develop a working relationship,” Herrity said. The next two areas of problems are with peers and with the person’s relationship with God. “Often they work with people who are not Christian, so trying to find common ground to have a relationship and even with fellow Christians at work, is a struggle,” Herrity said. The last theme is the struggle of the concept of business, since he said business is often portrayed as a bad thing in the media and how they need to figure out where they fit in the world. “It’s all about relationships in the end, and there are all different kinds of relationships to nurture,” Herrity said. Herrity has his main in-depth interviews for his research with 15 students and will continue to address problems and give advice on issues with spiritual peace or the boss. “What I am finding is the solution to the problems is the path to healthy life, a fulfilled Christian life,” Herrity said. He hopes that his research will potentially lead to something more one day.